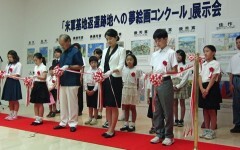 Okinawa Governor Hirokazu Nakaima and the winners of the “Painting contest 2010, Dreaming of the land after the return of the U.S. bases,” cut the tape at the Okinawa Prefectural Museum & Art Museum in the afternoon of May 20. “Painting contest 2010, Dreaming of the land after the return of the U.S. bases,” an exhibition of the winning entries, commenced at the Prefectural Gallery of the Okinawa Prefectural Museum & Art Museum on May 20. The exhibition at Okinawa Prefectural Museum & Art Museum will end at 6:00pm on May 22. It is then scheduled to be held at the municipal offices of Urasoe, Okinawa and Ginowan, followed by the village office of Nakagusuku.